At UberSignal, our goal is to help you through the entire process of selecting, receiving and installing your cell phone signal booster. We understand that cellular technology can be confusing at times, so we aim to make researching and selecting your booster as easy as possible. In addition, we're always here to answer questions about your current situation or the equipment that we sell. We realize that sometimes situations require a more complex solution than the standard kits we offer, so we're happy to work with you to design a custom solution to meet your needs. It doesn't matter if you're an individual with a unique scenario or a major corporation, you'll get the same level of attention and detail from us. We understand that selecting a signal booster solution is only half the battle, so we offer expert phone support for installation assistance once you receive your system. Furthermore, we'll dedicate a seasoned expert to help you troubleshoot your equipment if you run into any problems during installation or operation. We want you to be completely happy with your new system, so we offer a 30 day hassle-free, money back guarantee, so you can shop with confidence. 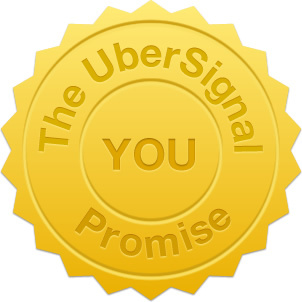 We care about customers, so we promise to provide the very best experience and customer service possible when working with UberSignal.